I love the fall season - lower temperatures, the start of the holiday season, layers...I love it all. To me, Fall represents a time of change and preparation for a new year. So, I'm planning to do a lot of spring cleaning, budgeting, and reflection to get ready for 2019. Sure, it doesn't sound like the most exciting things in the world, but I'm actually pumped to start laying a foundation for what's to come in the upcoming year. One of the most exciting components of any Fall wardrobe is a good leather piece. Leather items have become a “fashion must” for me. I love leather (leather leggings, leather boots, leather bags…give them to me PLEASE). I want to give you four leather pieces that you absolutely must have incorporated into your fall/winter wardrobe. A leather jacket is a wardrobe essential for me. 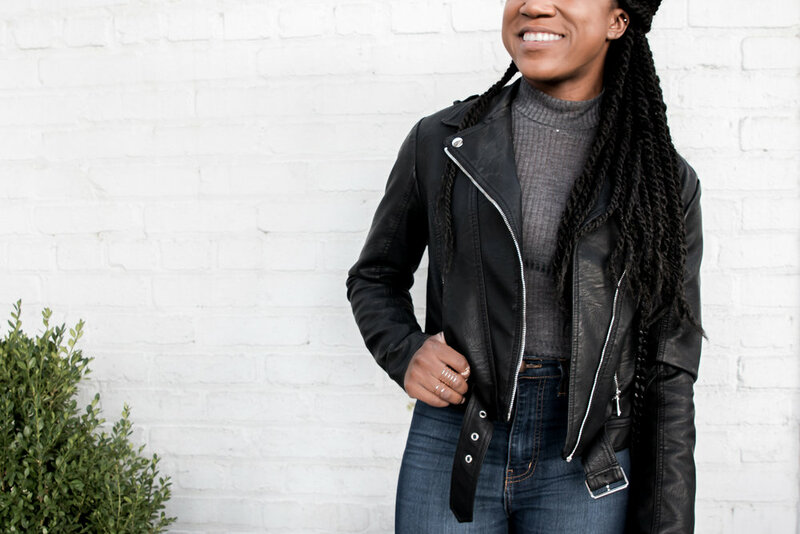 A leather jacket can go with ANYTHING - workout clothes, a dress, formal wear, and clothes for work...you name it and I bet you can make a leather jacket work with it somehow. For a morning consisting of just chilling at a coffee shop, I kept in simple with my leather jacket paired with a tight turtleneck, high waisted jeans, and boots. If you’re going to make a statement, then MAKE A STATEMENT. Leather boots give any and every look a little dose of edge. A good pair of leather boots will upgrade the look of and add a new level of sophistication to your Fall outfits. Whether it’s a cross-body bag, a tote or a clutch, a leather bag always makes a look more cohesive. A cross-body bag like this one is great because it holds everything without being TOO big for casual brunch or dinner. It allows you to look cute yet functional as you navigate through your day-to-day life. Having to wear business casual every day, five days a week can get boring. To break the monotony, I've really been into finding new ways to incorporate some personality and excitement into my work looks. We all know the work "go-to" pieces: slacks, blazer, top, etc. You can still keep all these basics work pieces but give them a little something extra by finding items of different textures. I found this leather skirt on Asos a while back and, since then, it has become a year-round item of choice for me. For this look, I paired my skirt with a simple black blouse and an over-sized boyfriend blazer/sweater (whatever you prefer to identify it as). I would wear this on a day when I want to be comfortable but have a lot of things to do (i.e. Monday). To finish off the look, I added a few dainty jewelry pieces, a cross-body bag, and classic black pumps. We know that you are beautiful no matter what you wear, but these leather must haves can add innovation and depth to your looks. These four pieces will help you slay for the Fall. Sometimes, it can be difficult to be fashionable but these items help you achieve a good slay with minimal effort. 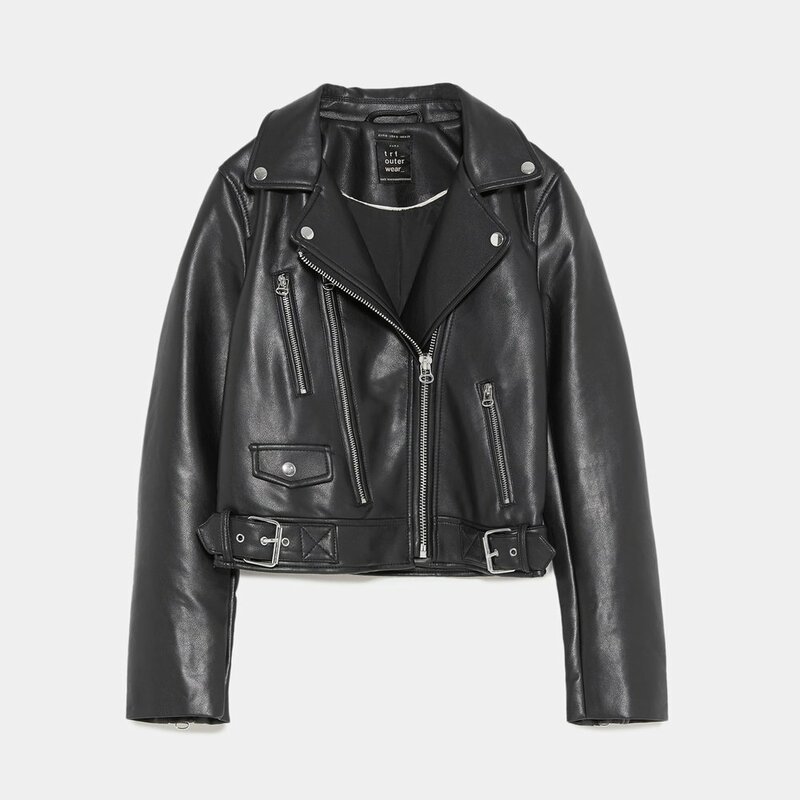 These simple leather wardrobe staples will be sure to upgrade all of your Fall looks!